The IntelliBox Basic, II and USB-LocoNet Interface support the LocoNet protocol over USB. Rocrail supports the Uhlenbrock LocoNet Interface (ULNI) with software handshake. The device drivers shipped with the device have to be installed prior to connecting the device and the computer. Afterwards the interface the device was assigned to has to be determined. On tab Interface the ID NEW is overwritten by an appropriate name, e. g. IB in the example. The computer interface determined beforehand is entered into the field Device, e. g. com1 in the example. The baud rate is selected according to the one of the device (standard: 115200). The Type has to be ULNI. Rocrail determine under Windows the available serial ports currently only to Com10. If the LocoNet Com port in the dropdown list "device" is missing, the actually assigned com port must be read up in the Windows system control and be entered manually into the field "device". 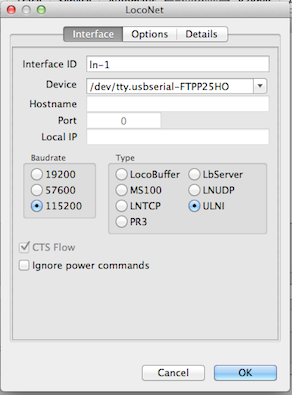 Set the CS Type: intellibox or ibcom for functions support > 8. On tab Options there are no adjustments available for the IB. The options tab is only for Digitrax. 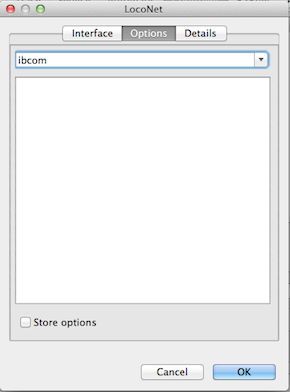 For the IBCom, the IB-Basic and the IB II, the value "ibcom" in the options-dialog has to be set. Otherwise, programming of decoders in Rocrail will not work (Programming Track). 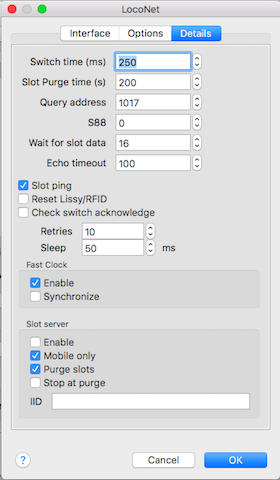 The Switch Time should be set to the maximum switch time of the IB (see also the description of Switch acknowledge below). Locomotives not in use will be purged from the refresh cycle after a time specified in the Intellibox (default two minutes). The value entered into the field Slot Purge time on tab Details should be equal or slightly lower than the purge time of the Intellibox, e.g. 110 seconds. The option Slot Ping can be used to inhibit purging by pinging the slot right before it would be purged. If the Slot Purge time is set to zero, the IB is supposed not to purge! This will lead to unpredictable situations: Rocrail will not check with the IB if the known slot is purged. Very small purge time values will cause unnecessary traffic for checking the slots. Locos that were controlled by Rocrail and were afterwards parked remain active if the option Slot Ping is active. If such a loco is selected on the Intellibox a warning will be shown telling the loco is already under control. Default Rocrail will read up to 16 packets until it give up waiting for a free slot. The default wait time is 100 * 10ms to wait for the echo of a command. Under some conditions this could be too short, and can be increased to max. 1000 * 10ms. The option "Check switch acknowledge" can be enabled to prevent sending a switch command to the IB while it is busy executing a previous switch command. Note: If Check switch acknowledge is enabled the Switch Time (see above) has to be set to exactly the maximum switch time value of the IB. Moreover, minimum and maximum switch times of the IB should be set to identical values, e.g. 200 or 250 milliseconds both. Genearally this option can and should be disabled. Number of attempts to set the switch and receive an acknowledgement plus pause between retries. It is recommended to set the sleep time to higher values (250ms maximum). The Slot Server must be disabled! This will conflict with the IB and could lead to a Rocrail server crash. The standard query address for getting the current sensor state is 1017. For Uhlenbrock sensor modules this must be set to 1016. See Addressing and Timing on how to address accessory decoders and how to set up switch and route switch times etc. Basic Settings → LocoNet Prog. → Art.-Nr. : <63120> → Modul adr: <1> → LNCV: 0= 1 and confirm these values. Values in angle brackets <> have to be entered as shown. In order to display loco velocity changes by means of the IB throttles correctly in Rocview option Allow zero throttleID has to be activated. 0x9* OPCodes are undefined; Related to the S88-LocoNet interface. The IB-Com does NOT refresh the loco commands on the track in case of mixed DCC and Motorola type of decoders. This will result in a loco stop after a bad contact, depending of decoder manufacturer, and not starting for a long time until a slot ping is issued by Rocrail. This problem cannot be solved without some advice from the manufacturer Uhlenbrock. Some undocumented LocoNet commands seems to solve this behaviour. This step is only needed if the device has been reprogrammed. LocoNet direct mode has to be switched off! Since the software handshake itself requires part of the bandwidth available the highest possible baud rate (115200) should be used in order not to slow down communication speed. Maximum Switch time; default setting is 5 secs. Using the OpenDCC signaldecoder and loconet, set the value to 0 to get a sufficient fast response of the signalpatterns.